Tyler Steele is an avid outdoorsman and has been guiding professionally since he was 19 years old. 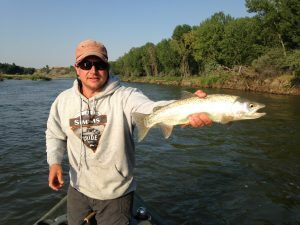 Originally from Tennessee, he began his career in Wyoming guiding elk hunts and eventually transitioned to guiding fly fishing. Tyler now calls Fort Smith his home and spends most days fishing the Big Horn, in the wooden boat he built himself. He loves sharing his passion of fly fishing with everyone who steps into his boat. In his free time, Tyler can be found hunting, fishing, backpacking, and white water rafting with his wife Katie and their two dogs Boone and Oona.